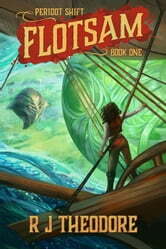 "I can't stop thinking about the world of Flotsam. Science-fiction, alchemy, and airships. It's magic." "Combining the best elements of steampunk and space opera, placed in a lavishly detailed and imagined world, Flotsam will hold you firmly till the final page." "A crazy blending of Steampunk, Fantasy and SciFi that takes you on a genre-bending wild ride through the skies of Peridot. The worldbuilding is incredibly epic for a newly minted author and hints at uncovering even more as this series evolves." "Flotsam sucked me in and wouldn’t let me go. R J Theodore is a fresh voice who will soon be on your must-read list!" "Peridot truly comes to life on the page; it’s remarkable that Theodore manages to establish the world and its cultures and races so well straight off the bat." Struggled to finish just too little of a lot going on. There is a glossary at the end of the book that I would have found helpful at the first to describe expanse of characters and places. Book has gods, aliens, and a crew of misfit beings that are fighting to retrieve items for pay. At the same time being chased by the imperial law of the planet. "A copy of this book was supplied by Parvus Press via Netgalley with no requirements for a review. Comments here are my honest opinion.